Read the story on Empire’s International page: Malaria causes 200 million illnesses per year and kills 600,000 people — mostly children under the age of five. The UN Foundation’s Nothing But Nets is a global, grassroots campaign to save lives by preventing malaria. 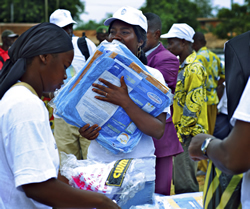 The campaign purchases long-lasting, insecticide-treated nets, distribute them, and educate families on their use. Malaria is a big problem – and the disease has big consequences for families, communities, and countries. Fortunately, there are small things that can help make a huge impact in the fight against malaria. Read about Nothing but Nets and Ted Turner who gave a billion dollars to make this possible. This entry was posted in General and tagged Malaria, Nothing But Nets, Ted Turner, United Nations Foundation on September 15, 2012 by wahtera.